In this interactive workshop, new attorneys will learn specific tips for incorporating the advanced-writing skills that distinguish the best lawyers’ work product. We will critique, edit, and revise excerpts from recent famous cases, deals, and disputes. 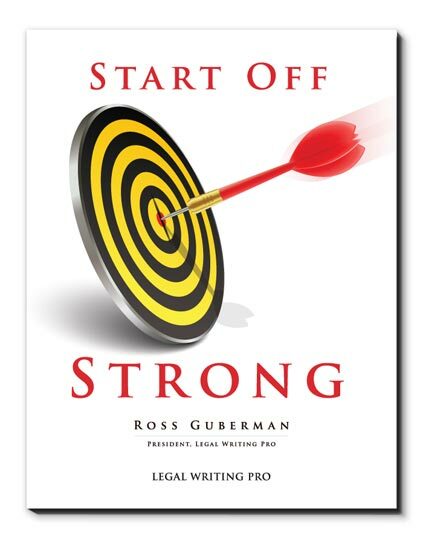 Participants will also receive my Attorney Toolkit with custom models, checklists, and answers to the writing questions they’re likely to have their first year and beyond. They will also receive a contract-drafting guide and other resources. Hundreds of new associates attend a Start Off Strong program each year. Participants consistently endorse the program for colleagues; the average overall evaluation is 4.95 on a 5-point scale. If you’d like to learn more about our Start Off Strong workshop, please fill out the contact form below.